This sample was colored by one of my middle school students. The white dots glow in the dark. 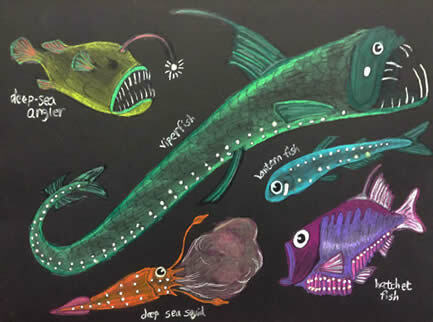 To learn about the luminescence of deep sea fish as well as to enjoy doing an art project. A pattern is printed onto black paper. Students use colored pencils (see recommendation below) or crayons to color fish, then add glow-in-the-dark highlights on the areas that really do glow.